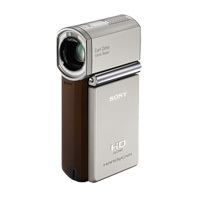 Shoot amazingly crisp HD footage with an unbelievably small camcorder that lives up to the Sony name. 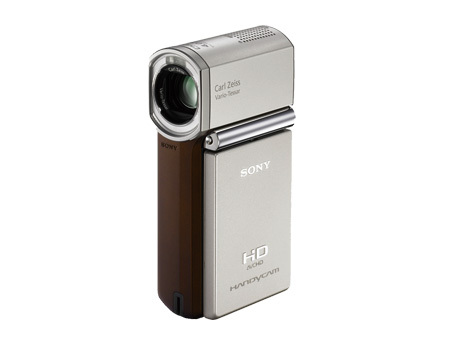 The HDR-TG1 Handycam camcorder records Full HD 1920 x 1080 resolution video from a lightweight, slim body crafted from pure titanium. It's tough enough for everyday HD video shooting and perfect for travel with its compact size that won't take up much room in your bag. The stylish design incorporates a Premium Hard Coating for superior resistance to even the smallest scratches. It records to convenient Memory Stick PRO Duo media, and Sony's ClearVid CMOS Sensor (with Exmor derived technology) and BIONZ image processor provide spectacular video and stunning 4.0 megapixel still images. Face Detection technology is also included, which automatically finds and enhances faces for beautiful results. Record stunning, incredibly detailed video footage in the clarity of 1920 x 1080 Full HD resolution. Slim and lightweight -- only 8oz without the battery -- the HDR-TG1s body is constructed of high-quality pure titanium. Additionally, a Premium Hard Coating is applied on the body surface (except for hinge and lens ring area), providing superior resistance to scratches and fingerprints. Made possible by the BIONZ image processing engine, Face Detection technology recognizes up to 8 faces anywhere in the frame and automatically controls focus, exposure, and color to help capture smiling faces brightly and clearly. Face Detection technology also helps make skin tones look natural without affecting other colors in the image. Sony's newly designed CMOS image sensor delivers bright, vivid, and spectacularly detailed 2.3 megapixel (effective) video footage, as well as 4.0 megapixel still images -- all with prolonged battery life. Exmor technology captures images with high resolution and high sensitivity. In addition, the advanced Sony BIONZ image processor improves camera response time and screens out noise so the signal from each pixel is as pure as possible. Sony has created a camcorder with the ability to fit in a shirt pocket, yet still capture stunning Full HD resolution video and 4.0 megapixel still images. Whether for personal or business use, around town or on vacation, the HDR-TG1 is the ideal travel companion for capturing those special memories. The 2.7"1 Wide (16:9) LCD screen provides exceptional viewing clarity with improved resolution (211K pixels). The display rotates up to 270 degrees for multiple viewing angles, as well as provides sharp, detailed images for monitoring or playback. The widescreen format makes shooting in 16:9 mode and composing shots even easier.